Canton-based Yazaki North America, Inc., employees have been working for the last five months to volunteer their time to help the community — and that has led to donations to charity. 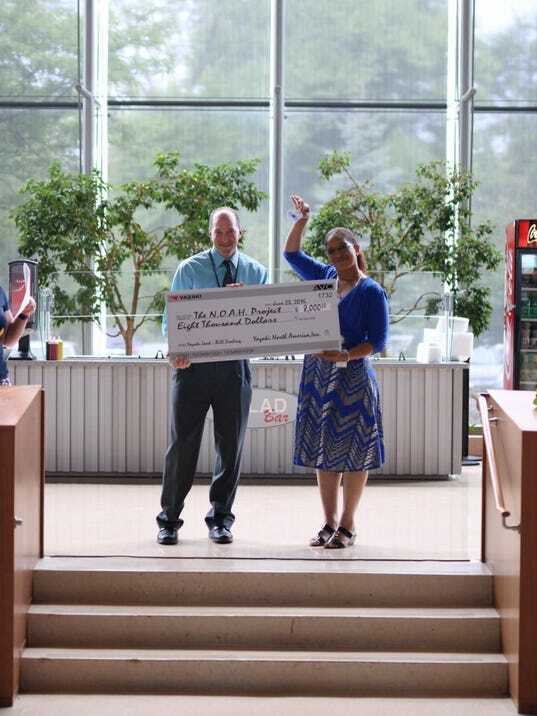 To recognize the employees’ hard work, the Yazaki Associate Volunteerism Council (AVC) donated $44,000 during an office-wide ceremony June 23 at the company’s Canton campus. The money was raised by funds from casual jean Fridays, bake sales and merchandise sales, among other events. 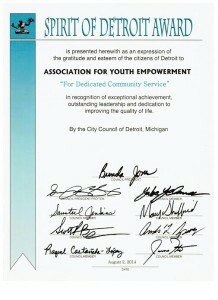 The Association for Youth Empowerment (http://ayedetroit.org/). Fleece and Thank You (http://fleeceandthankyou.org/). Gleaners Community Food Bank (http://www.gcfb.org/). The Greening of Detroit (http://www.greeningofdetroit.com/). The National Neighborhood Properties Community Development Corporation (NNPCDC). 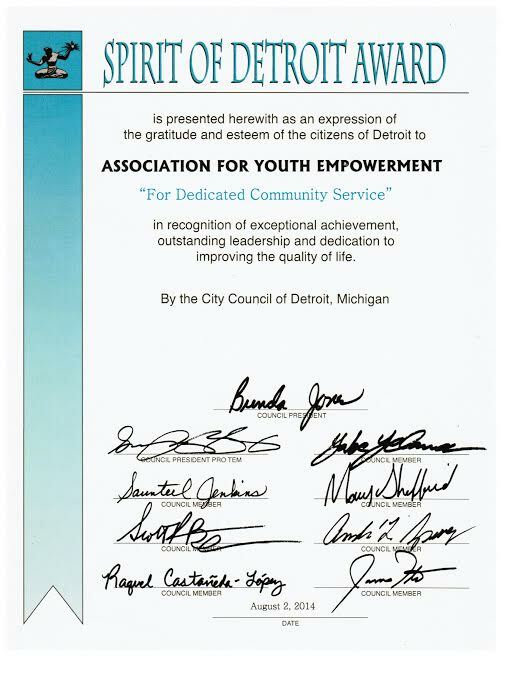 The submission that won the first place prize of $8,000 was the NOAH (Networking, Organizing, and Advocating for the Homeless) Project – led by YNCA financial business planner Bill Drabing – to empower the low income and homeless in Detroit. The NOAH Project, which operates a Community Center in downtown Detroit, offers lunch four days a week, one-on-one social services, physical health counseling, empowerment-based programming, and emergency needs to help strengthen family support systems locally. Presiding as guest speaker of the Yazaki ceremony was Nigel Thompson, Yazaki North America president and CEO. He said he was impressed by the diversity of the projects and volunteers. 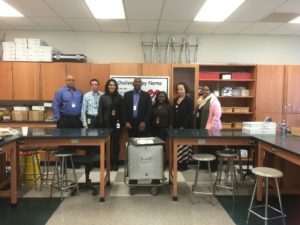 The board of the Association for Youth Empowerment (AYE) would like to thank and acknowledge Yazaki North America for their support of the April 12th Empowerment Zone Initiative with the topic: Breaking the Silence. We were honored by your presence and we appreciate the support that Yazaki has shown to support AYE’s mission, which is to partner with community members and organizations who share a common goal of eliminating social oppression and fostering respect, acceptance and compassion in our schools and communities. The intention of the event was for the kids to understand why “Breaking the Silence” is so important and also that they know that child abuse happens in all levels of society (rich and poor), any age and both boys and girls are abused. The event met its intent, was very well attended and all had a great time that was both rewarding and fun! The support meant a lot as the kids were aware that they have the support of the community and that the community that is available to them is broader and bigger than what they see every day. Thanks so very much again and we look forward to partnering with Yazaki North America again in the future. Thanks Again from the AYE Board! Prejudice, fear, hate. What we don’t know can hurt us, can hurt our children, can hurt our community. Distributing information can help. Creating understanding can heal. On December 5, our community members have a unique opportunity to participate in a program designed to get us to look inside ourselves and listen to our neighbors. The day-long program is called Challenge Day. It was initially developed to facilitate dialogue within schools. But the December 5 Challenge Day has been created to facilitate dialogue across the lines that divide our community. “The people in the city have a story about the people outside the city, and vice versa. You know what 8 mile represents, right?” says Jeff Gabrielson, who is involved in Bridging 8 Mile, an Association for Youth Empowerment (AYE) initiative that brings people of different backgrounds and social experiences together to realize a common humanity. “If you’re going to love your neighbors as yourself, without knowing your neighbors, how are you going to do that?” asks David Abramson, Gabrielson’s collaborator. The two share a commitment to creating connections within the community, and several years ago set a goal to create a community building network. Both had been involved in Challenge Day in schools, and decided to try it in a community setting. Since getting involved, they have been responsible for tens of thousands of kids going through the program. “It’s the one tool we know helps in groups,” says Abramson. 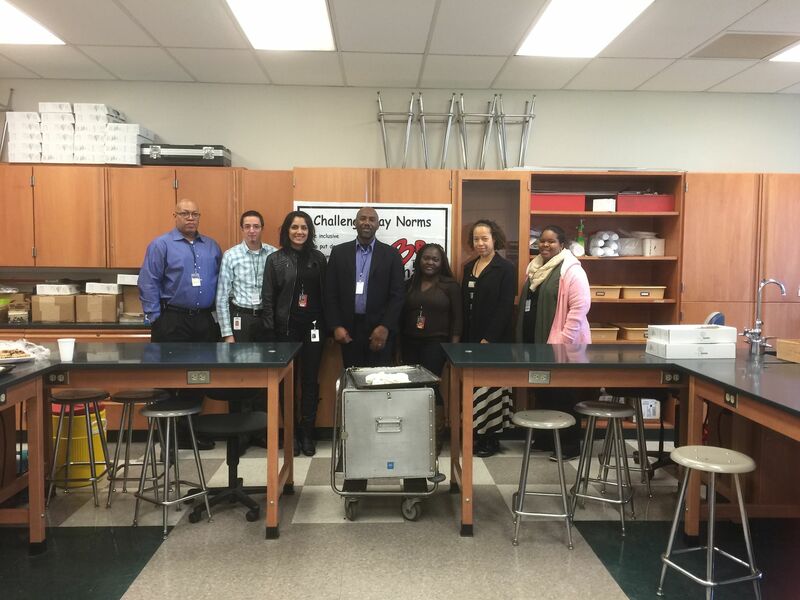 The transformational school Challenge Days have been featured on television by Oprah Winfrey and Leeza Gibbons. Students share, confess, cry, connect, apologize, thank, hug and walk away with a far greater understanding of the thoughts, feelings, and challenges faced by their peers. In the December 5 Community Challenge Day, Abramson and Gabrielson plan to bring together over 100 people, of different ethnic backgrounds, races and religions ~ most of whom are complete strangers to each other. “By the end of the day, because of the groundbreaking nature of the Challenge Day, the attendees will experience community and the possibility of a new future for our region,” says Abramson. Let Us Be A Part of Change! 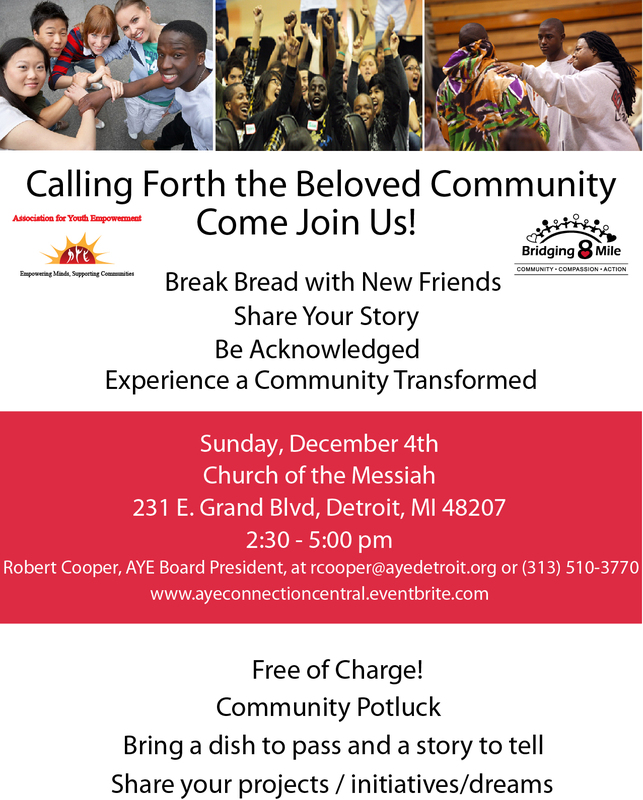 We request that you support the upcoming Community Challenge Day being sponsored by the coalition of AYE (the Association for Youth Empowerment), DION (Detroit Interfaith Outreach Network) and BDYM (the Better Detroit Youth Movement). Here’s the deal … On December 5, 2015, we will bring together 100+ people, of different ethnic backgrounds, races and religions ~ most of whom are complete strangers to each other. By the end of the day, because of the groundbreaking nature of the Challenge Day, attendees will experience community AND the possibility of a new future for our region. We say that overcoming the separation AND BREAKING DOWN THE STEREOTYPES is the first step in experiencing our neighbors as ourselves ~ which we say is the key to making Detroit the city of our dreams. Challenge Days break down stereotypes! Please join us! Registering to attend the Challenge Day on December 5th is easy. Just click here. If you can’t join us, please donate to support out efforts. Just click here. Here are 3 video clips that share the impact of Challenge Day. Leeza Gibbons’ and Marianne Williamson’s videos are less than 3 minutes long and Oprah’s is 8 minutes long. Please check out one – or all – of the videos, and then follow your heart. Please call Pandy Kemp at 313-492-7702 or David Abramson at 734-646-2274 if you have any questions. We will be happy to answer them. Thanks to the active participation of our AYE community, we’re growing our programs, projects and activities at breakneck speeds – through Community Challenge Days, Prosperity Year Gatherings, Dave Ramsey’s Core Financial Wellness classes and other transformational growth and development programs. 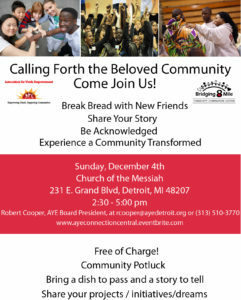 To fully make the opportunity and possibility of our work available to our metro Detroit community, we’re seeking your assistance. The Association for Youth Empowerment is looking for part-time volunteer assistance with organizing and tracking our many projects and activities. The commitment you make is to getting more out of it than you put into it. To learn more about this training and development opportunity, please contact AYE Board President, Robert Cooper, at (313) 510-3770. AYE is dedicated to challenging and empowering young people to create the Beloved Community. We partner with community leaders and organizations who share a common purpose of recognizing social oppression and fostering respect, acceptance and compassion in our families, schools and communities. 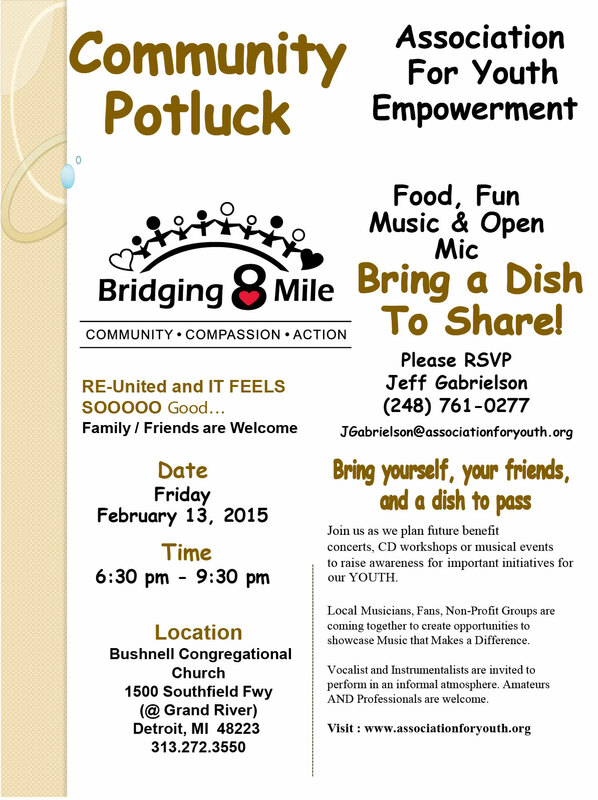 You’re invited to join friends and family of the Association for Youth Empowerment for a community potluck on Friday, Feb. 13th. Our Community Potluck is an occasion for us to to come together and share joys, challenges, music making and whatever else evolves! All are welcome – young and old alike. 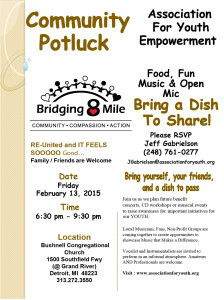 Bring yourself, a friend, a neighbor, a dish to share, an instrument or a song to perform. 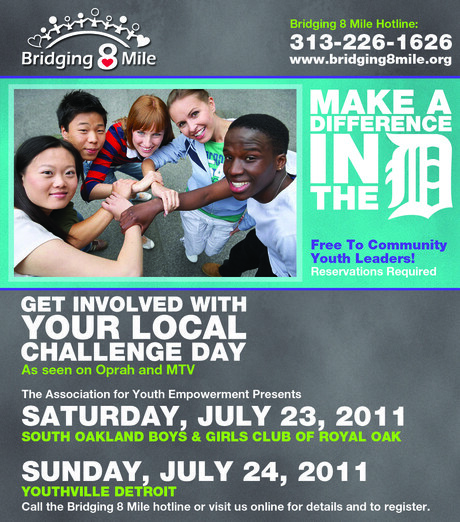 Bridging 8 Mile is an organization that seeks to unite the people who live on either side of Detroit’s city limits. In their vision statement on their website it says, “it is common for whites to view members of the black community as ‘the other;’ dangerous, untrustworthy, and ‘less than.’ It is common for the black community to view whites as, uncaring, untrustworthy, and hostile.”The organizations goal is to conquer this divide through structured events like the “Challenge Days” coming up this weekend. In this segment we hear from three members of Metro Detroit who appear to be bridging the divide: David Abramson, Robert Cooper, and Rasheda Williams. Click on the above audio player to listen and add your comments below. From a young age Jeff understood the power of community. Being one of six children and raised by parents whose top priority was family, he learned that together we can overcome anything and achieve what we desire. As a father of three, Jeff knows full well the challenges of raising children in today’s world. In 1999, Jeff became aware of Challenge Day, flew to California to experience the program and then began the process of building a team to share the program. In partnership with a group of local volunteers they introduced Challenge Day throughout the Midwest and Ontario, Canada. Over a decade ago, he made a decision to live his life with an open heart and to fully express himself by following his passion. As a result, Jeff trained as a Challenge Day Leader. Most recently he competed in and fulfilled a lifelong dream of completing an Ironman Triathlon (August 2013). As a small business entrepreneur, Jeff models the principles of honesty and integrity as core values. One of his greatest passions in life is being a connector of people and organizations to the resources they desire. He lives with his wife Gigi and children in Metropolitan Detroit, MI.